Discover our natural blanket wrapped with a new duck down. 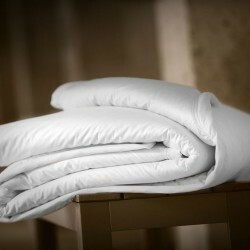 The natural filling of this bed cover offers an incredible softness in all seasons. This down blanket, extremely light, is ideal for people who are too hot or too cold because the down blanket has thermoregulatory properties. This layer of down is wrapped in a white cotton satin of incomparable softness. Its white bias finish is reminiscent of old-fashioned blankets. Made in France in our Burgundy workshops, the natural blanket is available in 4 sizes, perfectly adapting to single or double beds. In addition, the cover is customizable to the dimensions of your bed. It is possible to add an embroidery to your initials.